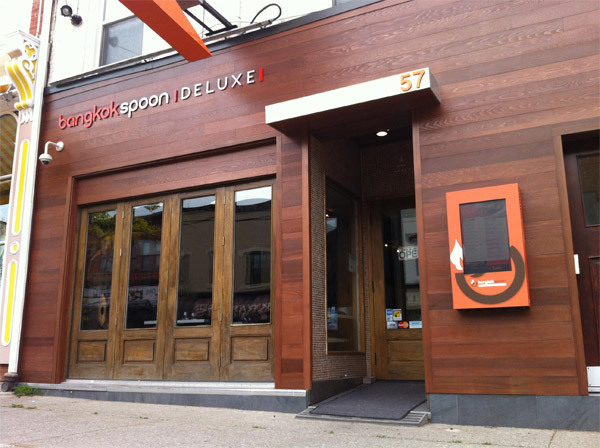 Bangkok Spoon brings pure Thai cuisine to the heart of the Dundas' King Street West. Exceptionally fresh and flavorful dishes abound on a delightfully extensive menu. Enjoy this authentic Thai experience in the relaxing ambience of Bangkok Spoon's beautifully appointed Asian inspired decor. Should you wish to entice your senses at home, take out and delivery is also available. Be sure to try the Pad Thai, the delectable house specialty. A wonderful and delicious array of soups abound, one for each day of the week, such as the fragrant Tom Kha Kai. Choose from an excellent selection of salads, such as the Spicy Beef Salad, teaming with melt in your mouth grilled beef and end your wonderful dining experience with the oh-so-good Honey Fried Bananas. Bangkok Spoon offers a truly memorable Thai culinary experience that will leave you wanting to come back again and again. We offer a wide range of Appetizers, Salads, Soups, Noodles, Chicken, Beef, Pork, Lamb, Vegetable Dishes, Seafood, Duck, Deserts & Beverages. Bangkok Spoon Deluxe offers a variety of Catering packages and Party trays. Let us take care of your next event or party today!